In the past decade after the devastated 5.12 Wenchuan Earthquake in Sichuan, academics and students from The Hong Kong Polytechnic University (PolyU) have been working on a series of inter-disciplinary projects to help enhance the resilience of the affected communities. PolyU held the forum on "Resilience: From Disaster Management to Disaster Risk Reduction – 10 Years After Wenchuan Earthquake" today (7 May) to share the achievements of the projects, to discuss with various collaborators and partners on the lessons learnt from the disaster, and to explore the way forward for the earthquake-affected communities. The forum was officiated by Mr John Lee Ka-chiu, Secretary for Security of the Hong Kong Special Administrative Region. Addressing the forum, PolyU President Professor Timothy W. Tong thanked the governments, international experts, donors, funding bodies, partnering institutions, non-governmental organisations and professional bodies that have been working closely with PolyU in Sichuan. Professor Tong said besides building the capacity of the community for managing disasters and physical rehabilitation, the PolyU projects have also taken care of the local people's psychological wellbeing. Activities covering the areas of disaster preparedness, emergency medical responses, social work, life education, psychology, etc have extended to more than 30,000 beneficiaries. Many of the endeavours, integrating the elements of education, research and service, have also been developed into models that benefit more communities in Chinese mainland and overseas. In his keynote speech at the forum, Dr Animesh Kumar, Deputy Chief, United Nations Office for Disaster Risk Reduction (UNISDR) for Asia and Pacific Region, highlighted the lessons from the Wenchuan Earthquake and the impact of the efforts taken since then on disaster risk reduction. He also updated the participants on the implementation of the Sendai Framework — the first major United Nations agreement on post-2015 development agenda, which sets quantified targets for substantially reducing disaster impact and preventing new risks for 15 years up to 2030. At the forum's panel discussion, representatives of a number of PolyU's key partners shared their experiences in collaborated disaster management endeavours, and discussed on the way forward for the quake-affected communities. Principal and teachers of the Yingxiu Primary School – one of the schools suffering from devastated casualties in the Wenchuan Earthquake – also shared their recovery journey. Ten year on, PolyU has been involving in more than 70 projects for the quake-stricken areas in Sichuan on education, training, community service and research, having served over 30,000 beneficiaries. PolyU experts have also based on the experiences and data collected to develop into service models, or platforms for facilitating further innovative research or collaboration on disaster management. For example, PolyU has established the Chinese mainland's first Medical Social Work Station, which collaborated healthcare practitioners and social workers to provide cross-disciplinary welfare, nursing and rehabilitation service to the quake-affected people. The revolutionary approach has been adopted in several villages in Sichuan and Yunnan, with proven effect. The data collected, and the experience of training local welfare personnel, have evolved into innovative and impactful research models. PolyU team has also collaborated with mainland and international organisations on conducting research on disaster social worker training and earthquake risk assessment, as well as on reviewing the post-disaster rehabilitation and management model building and validation. 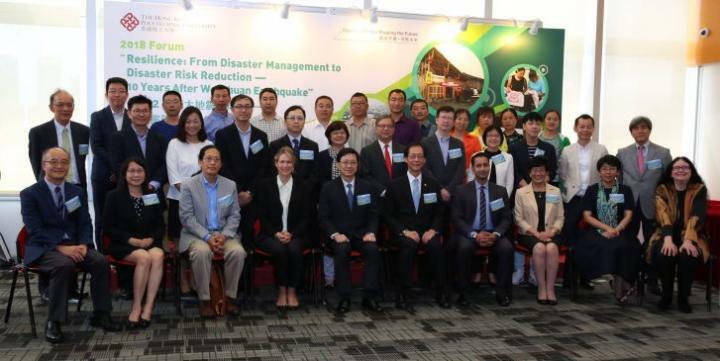 With generous support from The Hong Kong Jockey Club, PolyU and Sichuan University jointly set up the "Institute for Disaster Management and Reconstruction" (IDMR) – the first training institute of its kind in Chinese mainland. Officially opened in 2013, it has trained up more than 200 professionals in disaster nursing, occupational therapy, physical therapy, prosthetics and orthotics, and 42 doctoral graduates in disaster relief and reconstruction. IDMR graduates have become a major force in disaster management in the mainland; some of them also served in international emergency relief teams. PolyU also introduces disaster management experiences into students' wider university learning. In the past five years, over 800 PolyU students of different disciplines have participated in service learning projects in Sichuan. Besides visiting and learning about the earthquake-affected communities, they also engaged in a wide range of experiential learning and services, covering eco-tourism, eco-friendly mushroom farming, health screening, summer activities for deprived primary school students, exchanges with local youths, etc. Exhibition on "Resilience: From Disaster Management to Disaster Risk Reduction"
Aiming to enhance the public's understanding of disaster prevention and reduction, PolyU holds an exhibition on "Resilience: From Disaster Management to Disaster Risk Reduction" from 7 to 12 May. "Black Mushroom Farming" project that helps rural framers to grow healthier products in more efficient and safer ways with less pollution.